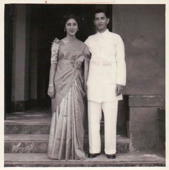 Photo from Amelia Singh's personal collection. Singh describes the photo: "Greeting the Indian Consul General upon his arrival in Phoenix. From left to right: Amelia Singh, Helen Ram, the Consul General, others from the community, woman in white, my mother in white, my father holding the hat. Phoenix, Arizona, about 1952." Certificate of Naturalization for Jiwan Singh, dated November 19, 1956 from the U.S. District Court of the District of Phoenix, Arizona.